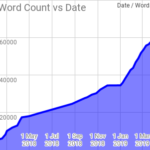 Posted on July 2, 2012 March 28, 2015 in africa, god, medical. Our first talk today was from Hilary Edgcombe, who started with photos of an elephant and a boa constrictor under anaesthetic, which was cool. Anaesthesia is the absense of sensation: so this includes local and general anaesthesia. 11% of world’s disability-adjusted life years are lost due to conditions amenable to surgery. Safe anaesthesia is necessary for surgical care. Aspiration (getting stuff in the lungs, leading to pneumonia or pneumonitis). Of 41 anaesthetic clinical officers in Malawi, 5 had seen a failed intubation. 2 had seen a case of pulmonary aspiration. 9 had seen a case of high spinal (requiring intubation)… in the preceding week! A lot of this is due to lack of equipment – in one study in Uganda, only 23% hospitals had enough equipment to safely anaesthetise an adult, 12% enough to manage a child and 6% enough to do a C-section. Pre-assess your patient: to optimise their condition, to make a sensible plan, explain/allay fears/concerns. Do a bit of catastrophising: formulate plan B, plan C.
Monitor your patient: ideally HR, BP, pulse oximetry, and end tidal CO2. Worst case, make sure you are looking at and feeling the patient. Don’t get into trouble you can’t get out of: if you think the airway will be difficult, don’t stop the patient breathing, etc. For the sick patient (who needs more oxygen or who can’t get it to their cells effectively), or for some anaesthetic techniques, oxygen is helpful. It can be difficult getting hold of O2 in the developing world for logistical reasons. 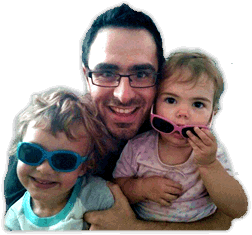 Safety – have they been maintained? Reliable if maintained and cost effective. WHO standard: operate up to 40 degrees, in 100% relative humidity with unstable mains voltage and dusty environments. Passing military shock, vibration and corrosion tests. Should be supplied with 2 years of spare parts. Ketamine is a super drug, its a hypnotic, analgesic, amnesic. It is not a muscle relaxant. It has some weird effects, since it can lead to patients have their eyes open throughout, and causes emergence delirium (the reason we don’t use it in UK). Tend not to end up hypotensive – slight rise in BP, HR and RR. Patients tend to maintain their own airways. Probably the least dangerous anaesthetic to use. Can cause laryngospasm due to hypersalivation, but less commonly than thiopentone. Can cross the placenta, giving you a spaced out baby. Remember ketamine can cause apnoea if giving fast IV. Avoid in patients with closed head injury, penetrating eye injury, and in whome cardiovascular stimulation would be harmful. 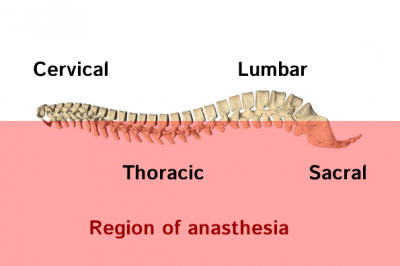 An introduction to spinal anaesthesia. A local anaesthetic block of all the nerve exiting the spinal cord below a particular level. Low risk – but not “no risk”. In an adult, the spinal cord ends around L1/L2, so going in below that, you are unlikely to hit the spinal cord. There are two types of any spinal drug. Normal, and heavy – the normal types are roughly the same weight as CSF. The heavy types are mixed with glucose, and obey gravity going low. 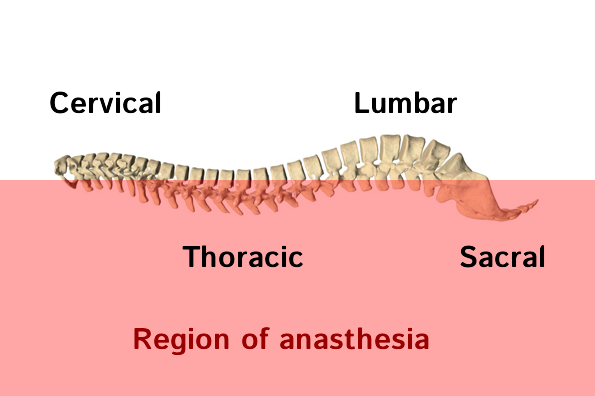 However, due to the lumber lordosis, if you give someone a heavy drug and lay them down immediately, the agent can pool in the thoracic region – see diagram on right. Common local anaesthetics: lidocaine, bupivacaine, tetracaine. Need to know relative baricity and appropriate doses for the drug. Exclude preservatives: since they can cause neurotoxicity. In the West, we tend to give some opiates with the spinal, but this is not something generally done in the developing world. Sepsis at site, or systemic sepsis. John Rennie and Colin Binks shared the next talks about surgical matters. They both apologised for the dwindling capacities of their ageing neurones, but assured us that with enough prompting they would be able to recall the more important arteries, etc. “You must take your bible, your toothbrush, your anti-malarials and the Textbook of Primary Surgery. It’s brilliant, full of pictures, and perfect for those of you who are far more comfortable cutting sausages than cranial burr holes”. Does my patient need surgery NOW? Strangulated bowel (need to stabilise patient first). 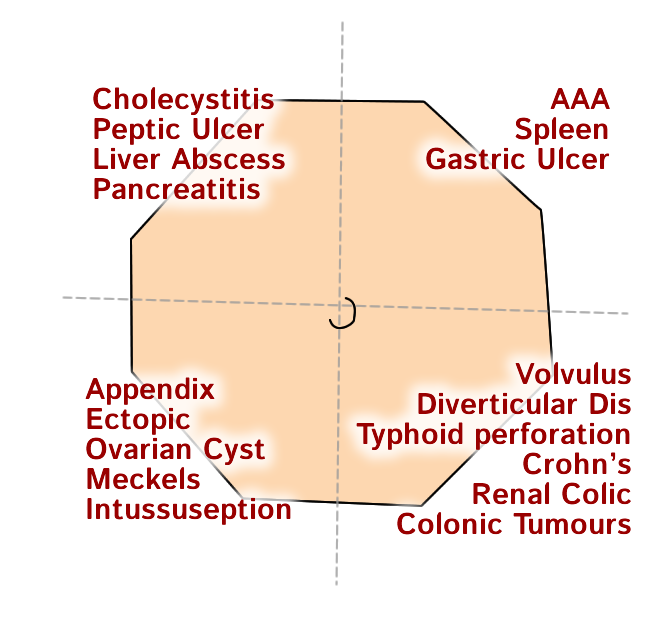 Peritonitis – perforation, pus (need to stabilise patient first). Does my patient need surgery at some time? Think: what resuscitation or other treatment is needed whilst observing? Can I do the surgery? Does my patient definitely not need surgery? Clinical assessment: if a little dry, potentially 5% dehydration, with very shut down, sunken cheeks, 10%. This is 7000 ml for 10% dehydration in 70 kg adult and 1000 ml in a 10 kg child. Resuscitation for fluid deficit will normally take 3-5 hours to optimise patient’s condition. Patients with active bleeding need surgery as soon as possible. 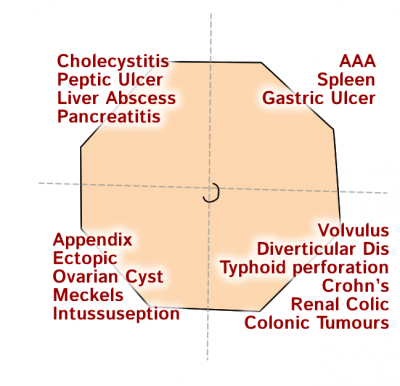 Loss of liver dullness – a valuable, underused resource. Air in abdomen will reduce dullness on percussion. In Uganda, there are currently 27 surgeons for 10 million people. Last year in Ethiopia, there was only one new surgical graduate in the whole country. Get a nice sharp knife. Carefully cut through the rectus sheath. Cut through the peritoneum, hold it aside from some clips. There will be a big woosh of horrible contents, if there has been a perforation. If there is bowel contents in there, use some sterile water to wash it out. If you haven’t got that, tap water is an awful lot cleaner than what is already in there. Find the hole in the bowel. 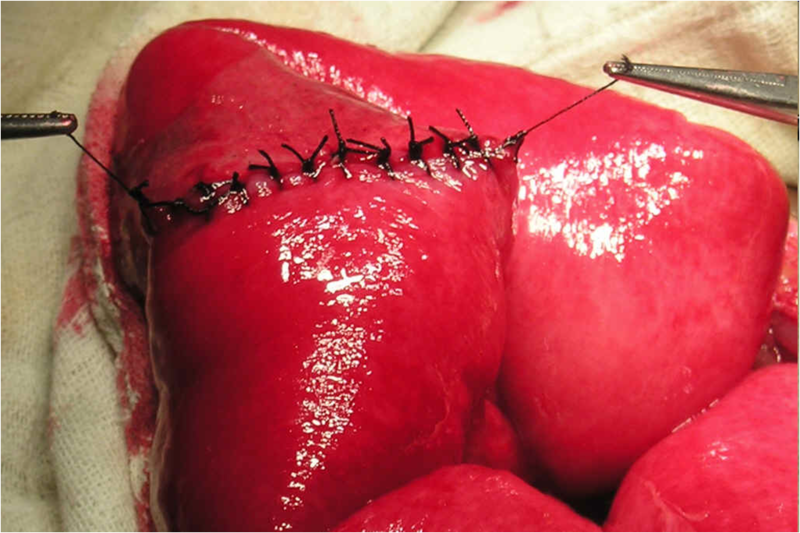 Gentle drag the omentum over the hole, and put some big loose stitches around it. Leave a drain in the abdomen, through a separate hole. Using some strong nylon, take all the layers together and close in a mass closure technique. If you have no strong thread, buy some fishing line and sterilise it. Put some loose sutures in the skin, closing it properly a few days later. Use clinical signs to ascertain which side. Use some local anaesthetic all the way through – which then tells you that you are in the right place. 5th intercostal space, mid-axillary line. Go just above the rib – because the vessels hang underneath the ribs. Make a small cut with a scalpel, then push through a Spencer Wells (see right). You will go through skin, then fat, then pleural. 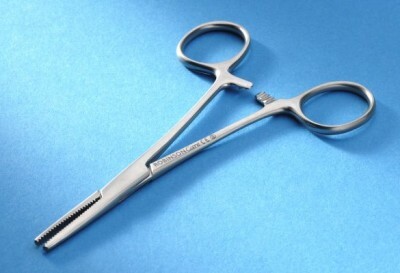 Open the forceps, and pop your tube through the gap. There will be pus, fluid or air that comes out. Put the other end of the tube under a water seal. Keep the underwater seal lower than the patient. Needs a full bladder, dull on percussion. Find the point an inch or so above the pubic tubercle, in the midline. Pop in lots of local anaesthetic. Make a small vertical incision – just 2 inches high – but add another inch for each depth of fat in obese people. Dissect down through the fat to the lineo alba – a white line down the midline. Carefully slice this in half, then hold the two sides apart. If there is any gut in the way, push it aside. Make a very small cut, and pop a Foley Catheter through the wall of the bladder. Measure 5 or 6 inches from the midline laterally, avoiding rectus sheath. After lunch, we had an afternoon of practical workshops with the team from this morning. My spinal actually worked! Wash out the joint, especially if there is debris in the wound. Deal with it within 6 hours, to prevent infection. 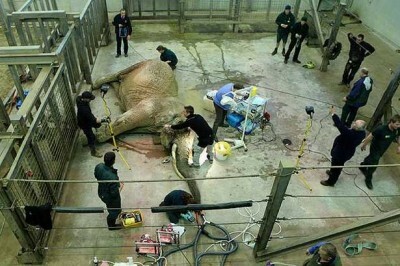 Examine blood supply, nerves, tendons, other structures. Bone chips should be removed from trauma wounds. Tendons and nerves should be tied end to end with silk stitches, and keep the wound moist. You would often not stitch the wound after you have debrided it, since you need to allow muck to escape. Different areas of the body will have different rules: click picture on right for more details. Delayed Primary Suture – delayed closing after 3-5 days. Secondary Closure – often for older wounds that have began to heal themselves through granulation, and may need skin grafting. There was also a fantastic Dentistry Basics session, which involved pulling teeth from a pig, and a Suturing Basics session. By the end of the day, I was definitely very ready for a curry. Which was lucky, since I was about to go to the East End for one. Posted in africa, god, medical.Tagged anaesthetics, Christian Medical Fellowship, CMF, cmfdevhealth, Developing Health, developing world, surgery.